TV Guide has unveiled a new San Diego Comic-Con 2012 Exclusive. 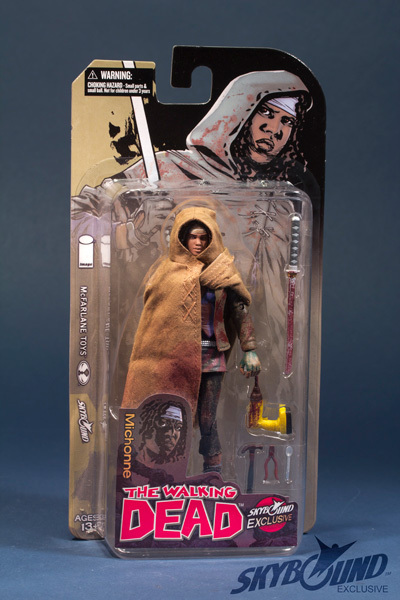 They have posted the first images and info for a Walking Dead Bloody Michonne with Cloak. This will be a Skybound Exclusive at the show. It will sell for $25. Discuss on the Toyark Forums› Views: 4616 › Credit: tvguide.com and FrankCastle of the Toyark Forums! 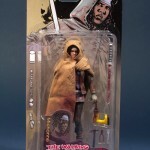 Yet another great SDCC 2012 exclusive. Found courtesy of Seatlepi article. 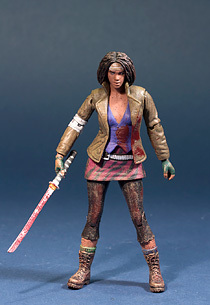 If only she came with her brother and his friend (the chained Zombies), THAT would indeed be an exclusive! That would be AWESOME. You would think McFarlane would do that since he loves making zombies so much. Even re-tooling the comic zombies, ripping off some jaws and arms- add a couple of chains. There were two in the comic and the tv show. Im 99% positive it was her brother and boyfreind in both. Its her boyfriend and his best friend....Awesome fig...must get.. So... is this going to be available online anywhere? Never bought any kind of Con exclusives before, though I'd really like to get this one if possible.